Recently released from prison, the person boards the San Francisco Bay Area mass transit train known as BART, joining a sea of unfamiliar people who are juggling phones and briefcases. The formerly incarcerated person’s knuckles turn white, his hand tight around the grab bar. Lam tells the person, whom he accompanies on his first public transit trip after exiting prison, to close his eyes, take deep breaths and try to ignore the crush of commuters. 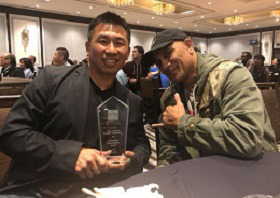 Helping people transition back to society has become a mission for Lam and others who work for and volunteer with the Oakland, California-based Asian Prisoner Support Committee (APSC). Founded in 2002, the APSC is one of the few organizations in the country dedicated to providing culturally competent services to Asian Americans and Pacific Islanders (AAPIs) who are incarcerated and formerly incarcerated. The organization, led by formerly incarcerated AAPIs, works primarily with the San Quentin and Solano state prison populations and the re-entry population in Oakland and nearby. During this country’s prison boom in the 1990s, the AAPI prison population skyrocketed 250 percent, while the overall prison population grew by only 77 percent, according to a study published in Amerasian Journal in 2005. The most populous AAPI ethnic groups in California prisons nowadays are Vietnamese at 22 percent, Filipinos at 20 percent and Pacific Islanders at 10 percent. Interestingly, AAPIs are often categorized as “others” in state and federal prison databases that house race and ethnicity statistics, according to the U.S. Department of Justice. Among “others” released from state prisons across this country in 2005, the recidivism rate was sobering — 72 percent arrested for another crime within three years. Organizations such as APSC “are also critically important for the sake of increasing public awareness about mass incarceration,” says Bill Ong Hing, a University of San Francisco law professor. While AAPIs are not as numerous in the prison population as African-American men, for instance, it’s important for communities and K-12 schools to provide resources for at-risk families in order to stem criminal activity and arrests, he says. Many currently and formerly incarcerated AAPIs come from refugee families, Hing says. While their parents worked multiple, minimum-wage jobs seven days a week to make ends meet, teens were often left to raise younger siblings — circumstances that may lead to criminal mischief and petty crimes that can eventually escalate into violence. Last month, the Association for Asian American Studies honored the APSC with its annual community organization award. The APSC is credited for launching San Quentin’s ROOTS program, which stands for Restoring Our Original True Selves. It is a weekly class for AAPI inmates who are mostly “lifers” — like Lam, sentenced when they were teens. Now in its fifth year, ROOTS is modeled after ethnic studies course curricula and draws about 40 participants every cycle. The program has strong emphases on race, culture, gender, sexuality and intersectionality. One aspect of ROOTS has called for participants to write about elementary school-related traumas to be shared with teachers in professional development workshops. 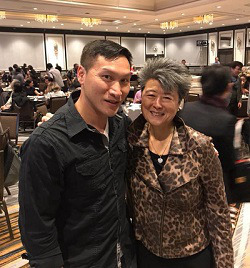 As valuable as ROOTS is to the AAPIs who are currently incarcerated, it’s arguably the peer support that is most significant to AAPIs who are integrating themselves back into society, says Lam, who is now APSC’s re-entry coordinator. “Who better to rely on and to be there for them than someone who has already come back to the outside,” says Lam, who has been a free man since 2016. The APSC also helps people re-connect with families. “When we did time inside, it’s like the families do time on the outside,” says Eddy Zheng, one of the co-directors of APSC who was incarcerated for about 20 years. But even formerly incarcerated people who want to renew family relations encounter difficulties doing so, says Holly Cooper, a University of California, Davis law lecturer. Solitary confinement, for instance, typically takes its toll on people. Mental illness and mental health problems are also common. Whether it’s finding housing or jobs, enrolling in community college or a four-year higher education institution, the APSC helps the formerly incarcerated navigate everything from bureaucratic labyrinths to daily necessities such as riding public transit and obtaining identification cards from the state of California. This involves immersion into the community in what Lam calls “care management” — rather than case management. So Lam and others spend many months accompanying each formerly incarcerated person to public events in Oakland and the surrounding area, such as barbecues and voter-registration drives, in order to make introductions to merchants, business owners and community leaders. It’s common for the recent returnees to participate in, or even lead, volunteer activities such as cleaning up shopping strip parking lots. Lam says that, in his two years at APSC, none of its formerly incarcerated clients have been sent back to prison. Although they focus on AAPIs, they have also helped Blacks and Latinos adjust to new lives. In fact, many APSC clients give presentations at neighborhood schools to discourage AAPI youths from making bad choices that lead to gang activity, violence and, ultimately, possible arrest and imprisonment. Despite the popular stereotype of AAPIs as straight-A students, there are youths — especially those from low-income refugee and immigrant families — who may turn to gangs as Lam did as a way to protect themselves from getting bullied over their limited English. The youth violence-prevention talks have helped slow down the school-prison-immigrant detention-deportation pipeline, says Zheng, who faced possible deportation back to China for his role at age 16 in a home invasion, kidnapping and robbery. California Gov. Jerry Brown’s 2015 pardon of Zheng erased the threat of deportation. Nationally, the deportation of formerly incarcerated AAPIs is increasing, especially in the case of Southeast Asians. Since 1998, at least 15,000 immigrants from Cambodia, Laos and Vietnam have received final orders of deportation, despite many of them arriving with refugee status and obtaining green cards. Also, more than 80 percent of those final orders were based on old criminal records rather than current offenses. Southeast Asians are three to four times more likely to be deported for old convictions, compared with immigrants of other ethnicities, according to a Syracuse University records database. UC Davis’ Cooper, who is also co-director of the law school’s immigration law clinic, says that Southeast Asians and people of Chinese and Indian ancestries make up “a significant part” of her deportation defense portfolio. Some of her cases involve people released from prison who are stuck in immigration detention facilities for as long as four years — without ever obtaining hearings before a judge. USF’s Hing says[LL2] that the public awareness raised by the APSC can help public defenders and defense attorneys consider more carefully the guilty pleas that they encourage their clients to accept because some of the plea deals leave defendants especially vulnerable to deportation. Lam, for instance, is a so-called stranded deportee. He was born in war-torn Vietnam, and his family was part of the “boat people” diaspora that fled Vietnam when he was a child. Growing up in the San Francisco Bay Area, he turned to gang life. After being sentenced for his role in a murder that occurred when Lam was 17, the felony conviction stripped him of his status as a legal permanent resident. He currently cannot apply for U.S. citizenship. Without a pardon from the governor, he is at risk of being deported. This article will appear in the May 3 issue of Diverse magazine.